Another project done. I was surprised it went so quickly. It was my first attempt at Fair Isle (stranded color knitting in two colors). It was also my first try at I-Cords (the ties). 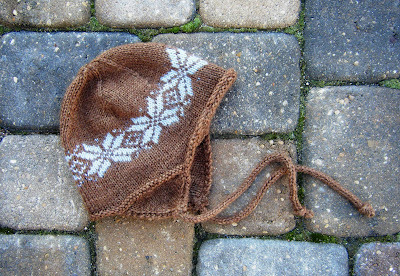 The pattern is the Norwegian Star Earflap Hat (pdf) by Tiennie. I knit it in Knit Picks' Andean Silk, Chocolate and Bluebell. Andean Silk is lovely yarn, made with 55% Super Fine Alpaca, 23% Silk, 22% Merino Wool. I knitted it as a gift for the baby boy of an old friend. I am quite delinquent in sending a gift. (So what else is new?) I really hope she likes it and forgives me for ignoring her new baby. I am a member of Ravelry, an exceptional online knitting and crochet community which has been an incredible benefit to me in learning to knit, as well as a source of inspiration and patterns. If you are a new or experienced knitter, this is a must-join site. If you join up, look for me and "friend" me! I am YellerDog (formerly CarolJumpIn) there. Just to update you on my knitting. I have one scarf completely done except for the tassels. Jess took it off the needles for me. Thanks for teaching her how! I have a second scarf nearly half way done, a third one in the car for when I'm a passenger and a fourth one - a pink one I am working on for my first granddaughter. That one I started first, quit and then started again. I think I have time! Wow Kay, sounds like you're doing great! ....first granddaughter?... LOL, a few people will be wondering about that one.